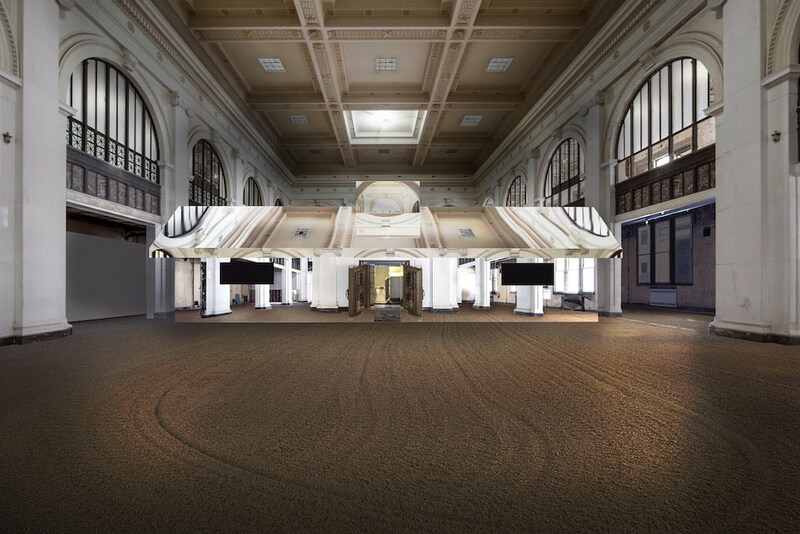 On October 10, the doors of Detroit’s long-abandoned State Savings Bank will open to the public and reveal a space radically different from the building’s original interior. Among the building’s elegant columns, historic bank vault, and vast interior space sits Doug Aitken’s latest art installation, a mystifying sculpture in the form of a one-story American suburban house, equipped with a maze of mirror-clad rooms and hallways that will leave visitors both disoriented and perplexed. The sprawling design, known as Mirage Detroit, diffracts and reflects every aspect of its surroundings, including the historic architecture of the antiquated building in which it resides. The resulting contrast is intense: the bank, with its bold sculptural supports, decorative enrichments, elaborate cornice, and over-scaled features, is juxtaposed with Aitken’s angular, mirrored sculpture and the room’s marble floor, which has been completely obscured by raw earth and river rocks. The merging of these elements conjures images of “a constantly shifting landscape that incorporates the organic and inorganic, reflects the past, and questions the future,” according to a statement from the artist’s studio. Mirage Detroit will mark one of the first times that the public has had open access to the State Savings Bank, which was built in 1900 and has been vacant for decades. The bank, which is impressive by virtue of its sheer size, classical décor, and adaptation to the urban American landscape, represents the history of Detroit while looking towards its future. It was saved from demolition after it was purchased by Bedrock in late 2014. Over the course of the exhibition period, Mirage Detroit will host an array of cultural events ranging from educational programs, musical performances, and community programs funded by organizations like Cranbrook Academy of Art, Art Museum, Museum of Modern Art Detroit (MOCAD), and College for Creative Studies.